Learn a little about polar bears with the kids, and enjoy our collection of fun printable activities and colouring pages. Did you know that polar bears have black skin and transparent, hollow fur - not white? The fur looks white because of the way it reflects the light. It is very efficient at trapping heat from the sun to keep polar bears warm, and for repelling water. They also have a thick layer of fat underneath the skin to help them stay cosy. Polar bears are marine mammals, spending many months of every year at sea. But they are the only marine mammal which can run - and cover many miles - on land. They live up to 25 years old in the wild. They are carnivores and have 42 teeth. They are well adapted to living in snow and ice conditions, with rough feet and short claws to help them grip ice, and webbed toes to help them swim. They can swim a long way! Male polar bears can weigh as much as 8 full grown adults put together, at up to 700 kg (1500lbs)! They can grow up to 3 metres (10 feet) tall. Female polar bears are much smaller than males, reaching about 2.4 metres (7 feet) tall and weighing up to 250 kg (650lbs). They have an average of two cubs. They dig themselves a cave, known as a maternity den, in a snow-drift and retreat to it to give birth, staying inside over winter and emerging in spring with their babies. Polar bear babies are very small - less than 1 kg (2lb) at birth! Polar bears eat seals, which they can smell up to a mile away! They will often lie in wait by a hole in the ice, waiting for a seal to pop its head up to breath, and then pounce! Seals are often hard to find, though, and baby polar bears often go hungry, with up to 3/4 dying before they are 3 years old. Humans are the polar bears only predator. With global warming, mining of coal and oil, oil spills and man-made pollution, polar bears are now regarded as vulnerable. Have you ever seen a green polar bear? Some polar bears in capitvity have begun to look green as algae grows inside their hollow hairs! If you are looking for an excuse to study polar bears, here is a good one! National Polar Bear Day is celebrated on 27th February each year. This big polar bear is missing his claws and mouth! Look closely at the picture on the right to add the missing parts to the picture on the left. Acrostic poems can simply describe the subject (in this case, a polar bear), or you can even tell a short story within your poem! Our printables also make lovely writing or drawing frames. The polar bear in this polar bear colouring page looks cute, but this animal is in fact very dangerous! Print and colour, with the words underneath for reading practise. There are two words to trace on this word tracing worksheet featuring a mighty polar bear! Here is a first handwriting worksheet for younger children featuring a lovely polar bear! Trace the letters with your finger and colour the picture. Here's a fun way to learn how to draw a polar bear - and to practise some copying and concentrations skills at the same time! Copy the picture on the left onto the grid on the right, one square at a time. Our polar bear handwriting worksheet uses four fonts that get increasingly difficult each time to help children practise letter formation. This cute polar bear lacing card is perfect for the colder weather. Follow the simple instructions, get your needle threaded and work your way around his easy outline. A great one for younger children. Use our polar bear story paper to write down facts about this magnificent animal, or make up a story with a polar bear as the main character. We have lined or handwriting lines to choose from. Tracing is a great way for children to practise early writing skills and our polar bear tracing page is sure to make it fun. 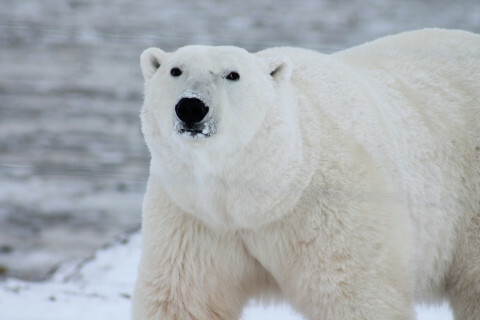 This polar bear worksheet gives kids a starting point for learning about these great bears. Use the internet or library to find out the answers and fill in each section. This polar bear writing paper should encourage the kids to put pen to paper - whether for a letter, or for their own polar bear story. Three versions available below. Use our cute polar bear scene story paper for creative writing, retelling a story or perhaps as a thank you letter? We have lined or handwriting lines to choose from.